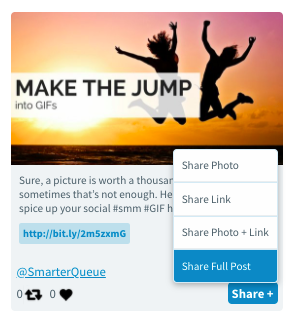 You can choose how to add curated posts to your Queue! Once you have found a post you want to share in Find Content, SmarterQueue asks you how you want to add it to your Queue. Share Photo — This will only share the photo from the selected post. You can then add your own text and link to the post if you wish. Share Link — This will only share the link from the selected post. You can add your own text and photo to the post if you wish. Share Photo + Link — This will share both the photo and the link from the selected post. This is perfect if you want to add your own text but keep the original photo and link. Share Full Post — This will share the photo, link, and text from the selected post. Once you select one of these options, the “Add a Post” box will appear pre-filled with your selected post. You can make any changes you want to the post before adding it to your queue.